Seven has maintained its share in the mid to low 20% range with My Kitchen Rules again ranking #1 show. After being challenged by Married At First Sight on the previous three nights this week, Nine released its grip with Planet Earth taking over the 7.30pm slot. No Married was also good news for TEN where a memorable episode of I’m A Celebrity…Get Me Out Of Here lifted the midweek audience closer to 850,000. Seven was again a network news winner and it was game on in both Sydney and Melbourne at 6pm. Home and Away trailed A Current Affair to rank #2 at 7pm. My Kitchen Rules travelled to Broome where the best married seafood lovers Josh and Amy could manage was 43 out of 110. The evening started with entrées scoring a five from both judges. Things plummeted downhill later though with the beer battered barramundi taking a long time to prepare before Pete gave it just a one while Manu managed a two. One competitor had to excuse themselves for a “spew”. Dessert was marginally better with a big eight from Manu for his pudding, but Pete could only manage a four. 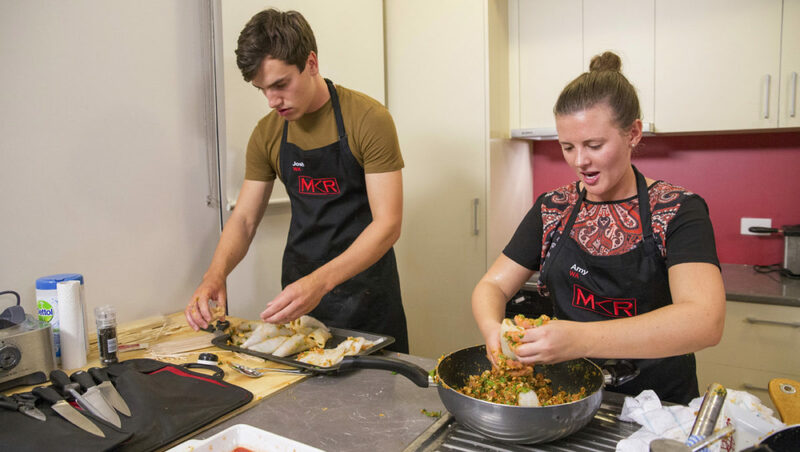 The midweek MKR episode ranked #1 for the night on 1.07m, but was down on 1.20m a week prior. The second week of Murder Uncovered returned with a single hour on 577,000, down from the debut episode on 957,000 last week. While there was no episode of Married At First Sight, the show got a good workout on A Current Affair with 770,000, which was enough to win the timeslot. Planet Earth II got the critical 7.30pm spot with 734,000 tuning in, ranking the show third behind MKR and Celebrity. It performed best in Melbourne with 220,000. Nine then launched its real crime show Murder Calls up against Seven’s Murder Uncovered. The Nine offering did 570,000, just 7,000 behind the Seven program. The doco Life Inside Jail then did 284,000. I’m A Celebrity…Get Me Out Of Here! recorded its biggest-ever Wednesday night audience with 842,000 tuning in to see Keira from The Bachelor show off her considerable reality TV skills. Not surprisingly #KeiraCracks subsequently trended #1 on Twitter last night. The episode was ranked #1 for the night 25-54, but managed to lead that demo in Melbourne, overtaking MKR. In total people in Melbourne, Celebrity tied with MKR on 300,000 with both shows narrowly trailing Nine News 6pm which ranked #1 in that market on 308,000. The second episode of This Is Us followed with 562,000, which meant it kept most of its launch audience of 576,000 from last week. Madam Secretary then did 186,000. Earlier in the night The Project was on 526,000 with some commentary this week examining the nuances in the relationship on-air between Carrie Bickmore and Waleed Aly. ABC News did 720,000 as the channel’s best. 7.30, Julia Zemiro’s Home Delivery and The Weekly were then all just under 600,000. Home Delivery featured Annabel Crabb last night and, get this, Lee Lin Chin will be featured next week. The Weekly featured an item on TEN and News.com.au contributor Joe Hildebrand, which has created a minor stir on social media regarding Hildebrand and his charity work. Tony Robinson Down Under was the only program to break above 200,000. As Vikings heads toward the end of its current season it was next best on 160,000, outperforming its lead-in, The Eighties, on 158,000.